A year ago, when we were in Onuk Island, Balabac, Palawan, the caretakers of the island pointed to us of how visible Mount Kinabalu is from our vantage under clear skies. With its proximity from the Philippines, it is no wonder food and culture has to meet on certain points. As we arrive at Kota Kinabalu, we were greeted by an official of a hotel with Filipino ancestry (Pangasinan), then we had dinner where the serving staff is a young girl from Tawi-Tawi, met another Filipino satay vendor as well and a night market named Filipino (across Le Meridien Hotel). These are but some of the reasons why Kota Kinabalu can definitely be associated and bombarded with territorial dispute controversy. But whatever the issue is, Kota Kinabalu has a distinct character that is truly Asian apt for the country’s slogan: Malaysia truly Asia. Almost all Southeast Asian countries with the exception of ours (the Philippines) are into mouthwatering and spicy cuisine. I am never into spicy foods for the reason that I easily perspire and it’s quite uncomfortable eating and perspiring simultaneously. However, when the aroma and the taste gets me, there’s no turning back – who cares if I perspire? Our first meal (dinner) in Kota Kinabalu was at the Waterfront – a bayside establishment with a myriad of stalls aligned offering authentic Malaysian (what do you expect?) and other Asian cuisine (no adobo of course). After a short stroll, we were lead to dine at one of those offering cheap and reasonable Mee Goreng – favorite dish of my travel buddies. Mee Goreng is a flavorful and spicy stir-fried noodle dish which is common in Malaysia, Indonesia and Singapore. I tried a small quantity and it’s already spicy for me while my friends’ tolerance for spicy food has not yet been breached. Thus, I decided to sample on no less than a chicken dish. To complete the meal course for dinner, my travel buddies ordered a number of ­satay (skewered chicken) with peanut sauce on a nearby hawker stall. Iced coffee and iced tea – the Malaysian version - served as our beverages. The following day before heading out to the airport, we have to try the highly recommended laksa at Kedai Kopi Yee Fung Restaurant situated at Gaya Street and a walking distance from Horizon Hotel. It is actually a coffee shop, but not the ordinary one we all are used to, as the main specialty is laksa – a spicy rice noodle soup. The weather was scorching hot when we found our seats and I was perspiring. Adding volume to my perspiration, was the spicy flavor of the soup yet I can’t refuse and must continue. I love the mix of flavors and the level of spice. A free soup refill was thus in order. While it is unusual for a tourist to roam around a public markets’ vicinity, we found ourselves there searching for souvenirs, gifts and for the mere sake of exploring. The usual wet and dry goods, spices and art crafts are among the given. A number of merchandise are Filipino-made not to mention the presence of Filipino vendors. As usual, the haggling skills come into test once more. And so we left the market satisfied. There are three pre-World War II buildings that survived the war in Kota Kinabalu and notable ones are: the building where the current Tourism Office is and the Atkinson Clock Tower. This is what the lovely Ms. Tova, Communications Manager of Horizon Hotel told us. Of course we’re not well-researched and adding to the fact that I don’t read maps as I memorize street names as we go along, we just walked through the famed Gaya Street and adjoining ones on a midday. A kilometer zero marker is prominently cemented on the pathway leading to the entrance door of the Tourism Office. The Tourism Office’ façade is unassuming. Never grand yet full of character. It looks like an old American house for me- a white colonial house as others may describe it. The building is said to have been constructed in 1916 to house the Printing Office and later the Treasury, Audit Office, Town Board, the District Office and the Attorney General’s Office. It was one of the only three buildings that still stands even after the bombings at the end of World War II. From the 1950s until September 1986, the Post Office occupied the building. Fully restored, it was named a heritage building and officially became the Sabah Tourism Building in January 1991 and currently serves as the Tourist Information Center. We were greeted by the attentive tourism officers of Kota Kinabalu as we enter and had a sneak peek of the varied tourism landmarks the country has to offer which surprised me big time. It pays a lot to have no expectations and less research. Too bad, we were about to leave the country any moment. There’s always a next time I suppose. We know what we are looking for but can’t seem to navigate well on its whereabouts. We are looking for a clock tower – the tower with a clock - I so declare and ask a random local resident. I can’t seem to find a way of describing it better as I don’t even have the slightest idea or picture of how it appears. On any building or tower serving as a landmark that I search for, I always look up for any towering structure and easily finds the answer. But this one is quite different. We have crossed several streets yet to no avail. But still with the consolation of more discoveries. Until finally, my travel buddies decided to read the map and we later on learned it’s just near our hotel but the structure is quite hidden. Nestled on the Brace Hill (Bukit Brace), the famed clock tower was named after the first District Officer of Jesselton, Francis George Atkinson. The latter’s mother, Mary Edith Atkinson of England caused the building of the clock tower in memory of her son who died of malaria at the age of 28. The original merbau wood used to build the clock tower has been replaced over the years but the over-all structure remains. During the 1950s, it is said that the tower’s light has served as a navigation aid to local ships coming to port but modernization came and so the same can no longer be seen from the sea due to the towering skyscrapers that surround. It was inscribed a heritage building in the year 1983. Stepping outside from where we are staying, the moderately busy intersection awaits. A sculpture of the great egret, city mascot of Kota Kinabalu, sits at the center with the Malaysia Monument as its backdrop. The Malaysia Monument commemorates the independence of Sabah and its inclusion in the Federation of Malaysia. A few steps from such structures are the Kota Kinabalu City Council and the City High Court. There are quite a number of interesting sculptures at the city center. Gaya Street serves as our reference point for the Do-It-Our-Own Walking Tour. I feel (?) like I lose weight in just walking for hours. The street is said to be the “Chinatown” of Kota Kinabalu. This is the home of a number of souvenir shops, wares, dry goods and merchandise at a relatively cheaper price. As we moved on, interesting murals caught our attention. 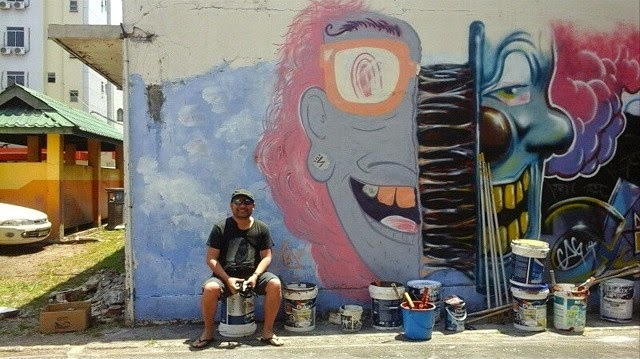 The urban art scene of Kota Kinabalu is definitely charming. Due to time constraints, the plans of visiting the mosques, libraries and museums were not realized. Thus, en route to the Kota Kinabalu International Airport, we passed by the Sabah State Mosque, the city’s main mosque, as our finale. We just literally passed by it. In less than 24 hours, that was a brief introduction for us of what Kota Kinabalu can offer. As the city is most proximate to the South China Sea, I envisioned this part of Malaysia to be an island destination. Surprisingly, as a short introduction, we have discovered the rich culture and history of Kota Kinabalu rather than a haven for beaches and rainforests where it is known for.